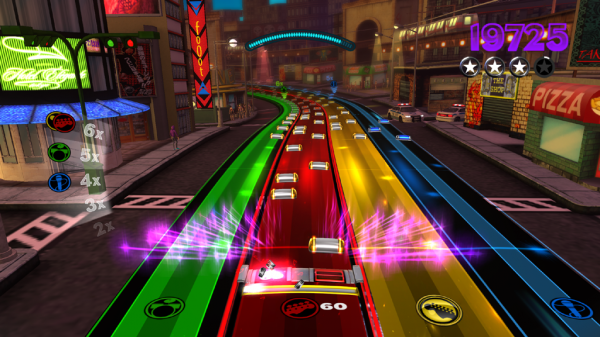 After spending the last four years releasing a multitude of sequels and spin-offs for its popular Rock Band and Dance Central franchises, Cambridge-based Harmonix Music Systems is scaling things back a bit with its next release. 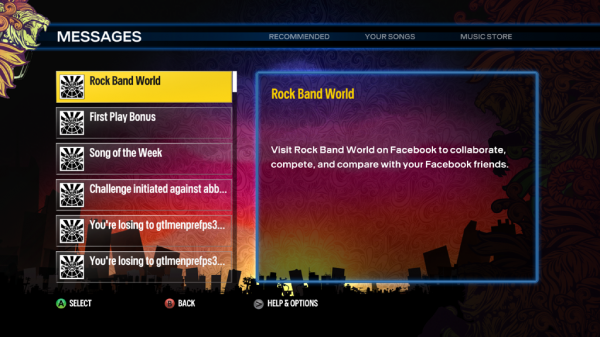 The next Harmonix-developed title the world will get is still part of the Rock Band series, but it will arrive at some point this summer sans the band. 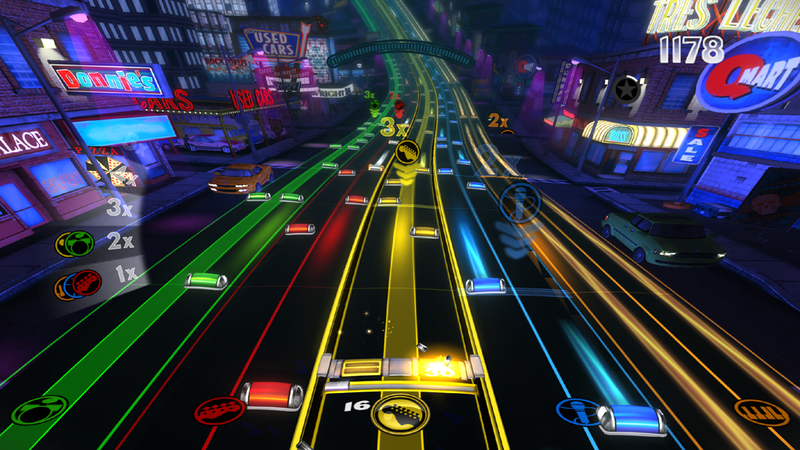 On Tuesday the developer unveiled Rock Band Blitz — a single-player XBLA and PSN game that rocks out without rock instruments, instead requiring the use of a regular controller for solo-jamming along all five instrumental tracks at once. The simplicity of the concept isn’t exactly in line with what fans have come to expect from the company that popularized plastic instruments, so it’s understandable if there is some hesitation from the community to accept this new direction. Project Director Matthew Nordhaus explanation during my trip to the developer’s studio that the team’s goal is to release a product that removes the series’ high barriers of entry through a more simplistic approach probably won’t have plastic rock stars pumped for the big show either. Read a few quick-and-dirty details on the internet and watch a quick clip of Blitz‘ gameplay and you might get the impression that this is just another case of a developer dumbing its game down for modern gamers who are, supposedly, unable to process complexity in their video games. Well, guess what? It’s not. Then it was my turn. 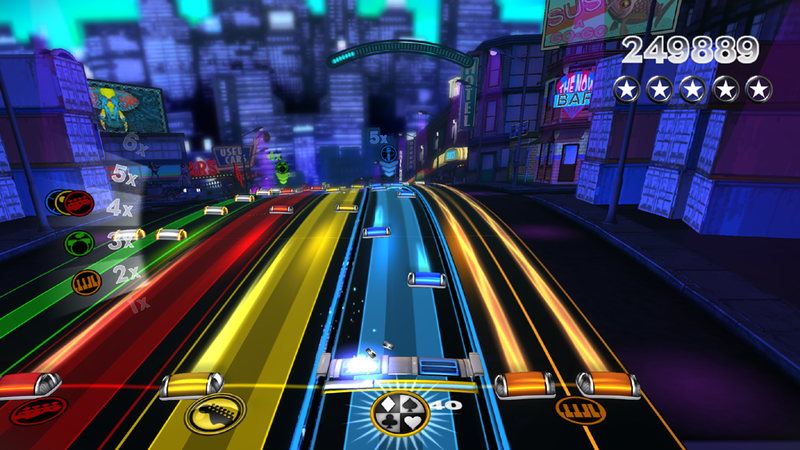 The demo only contained four songs to choose from, but Nordhaus promises the final game will have somewhere north of 20 tracks. They’re targeting around 25, but that figure has yet to be finalized. After flipping through the foursome, I hovered over Always by Blink 182 in the song selection menu. 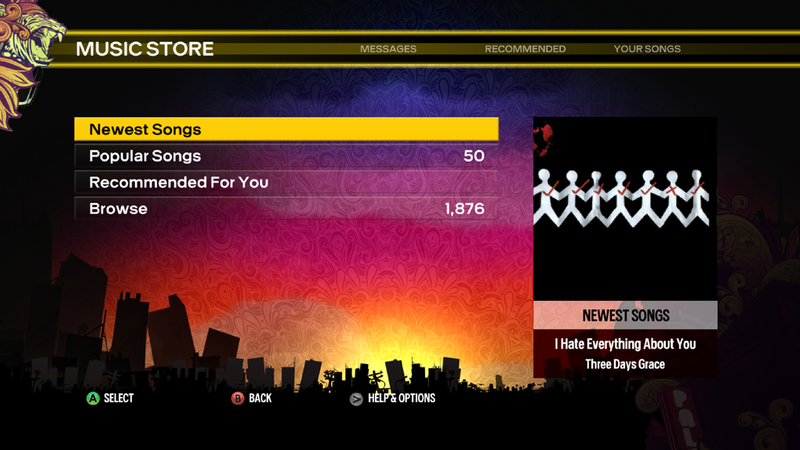 I’m warned that it’s difficult, but I’ve sunk a ton of hours into the numbered Rock Bands; so I went for it anyways. Despite having some real trouble in the early going — and during some of the more fast-paced portions of the song — I didn’t fail and managed to get a respectable four-star rating. It never felt like I was in danger of losing, either. That’s no cause for chest-bumping, though: it’s impossible to fail in Blitz. Well, that’s not entirely true. The team is hoping that failing to surpass your friends’ high scores will adequately replace bombing out on songs and that friendly (and not-so-friendly) competition will serve as the game’s challenge. With the accessories taken out of the equation, gamers have to learn how to rock all over again. Hitting all the notes isn’t easy, but when has it ever been? Doing so is now just the tip of the iceberg, however. 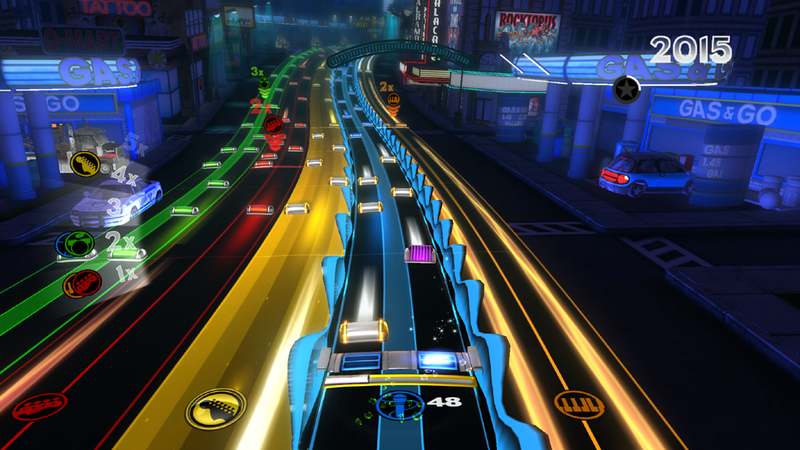 Streaking through songs and activating overdrive at the right moment presented challenges in Blitz‘ predecessors, but there was never really any question as to how to best pursue high scores. That’s no longer the case. Do you go for the sure points over on the easier tracks, or do you jump to the path of higher difficulty in pursuit of rock glory? You could stay on that bass track and keep streaking away to your heart’s content, but doesn’t that multiplier over on the drums look tempting? Of course it does, and sooner or later the temptation of a glowing multiplier symbol on another path will become too great. 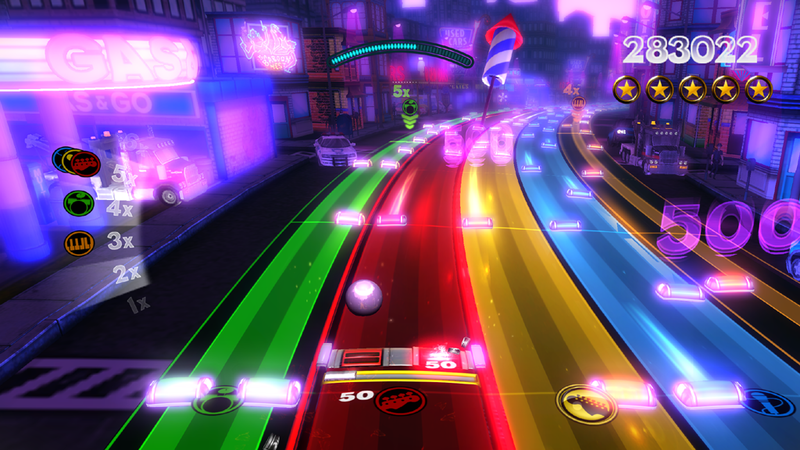 Additionally, there are certain power-ups that will call out to players for attention. Simply deploying them without breaking concentration and falling out of rhythm is difficult enough, but some of them require more than that. 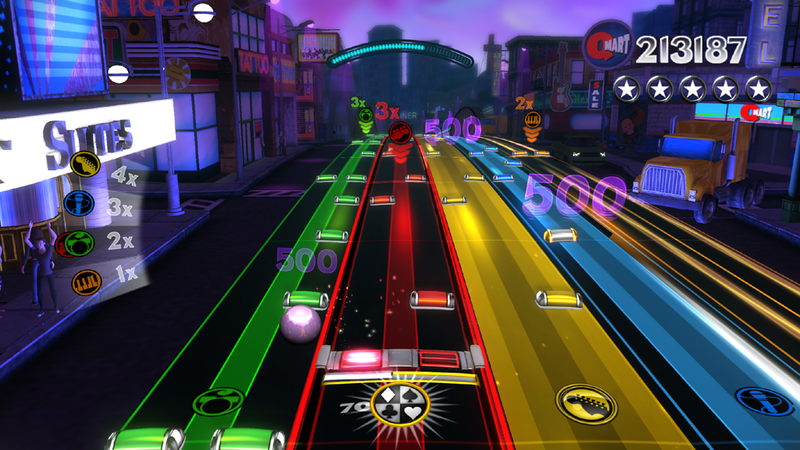 For example, a pinball can be blasted out across the screen and bumped back by the player when it comes hurtling towards them for extra points. The more times it’s bumped back into play, the more points will be accumulated. Don’t expect the thing to just come to you, however. You’ll have to jump around to get to it, and that often requires abandoning the current track being followed. Decisions, decisions. 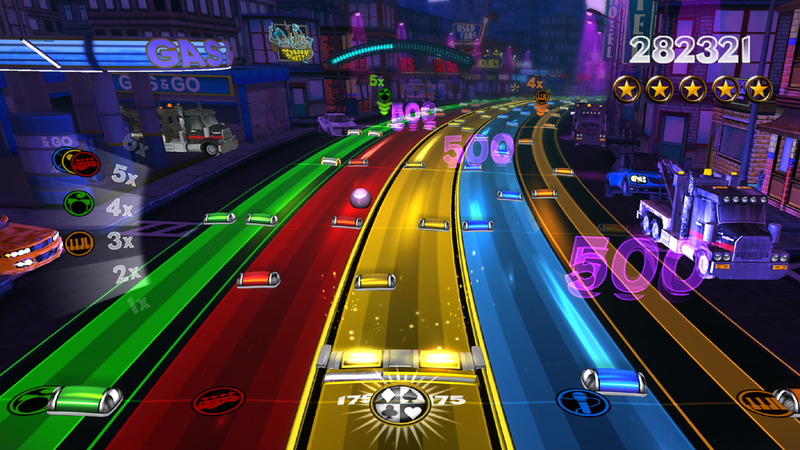 Power-ups can be chosen from before playing a song and must be purchased using in-game currency. 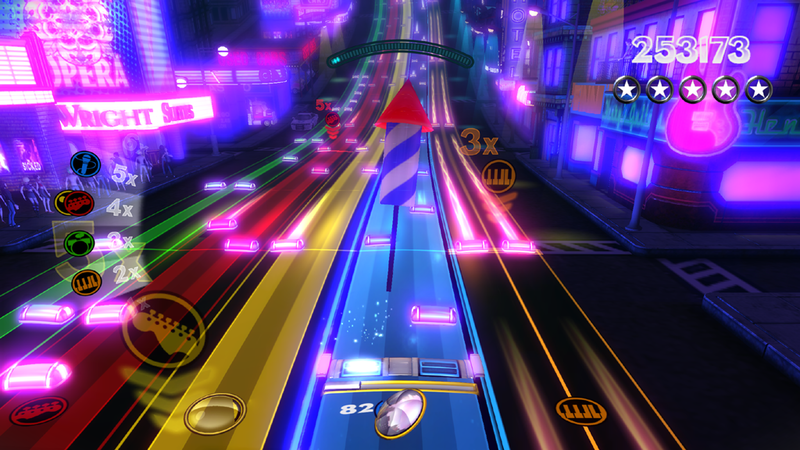 (Don’t worry, fans; Harmonix promises there will be no micro-transactions.) The final tally of special abilities is expected to be somewhere between 15-20, very likely 16, says Nordhaus. Adjusting to the concept of playing notes with A and the D-pad takes some getting used to, but it eventually clicks and works well enough. Make no mistake, this control method absolutely detracts from the fantasy of living out rock ‘n roll dreams from the couch, but it feels appropriate to the type of experience the team is trying to deliver. 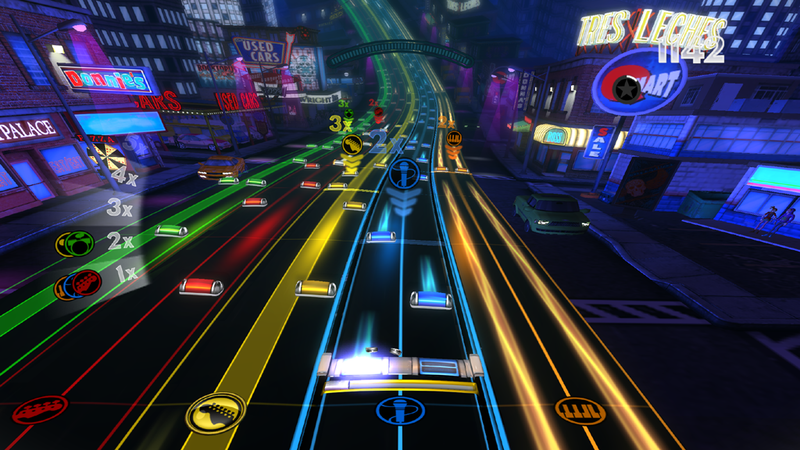 Hopping from the five instrument tracks that streak across the screen at once is handled by the triggers, and it’s an art that must be mastered if there is to be any hope at all of showing up your friends on the in-game leaderboards. 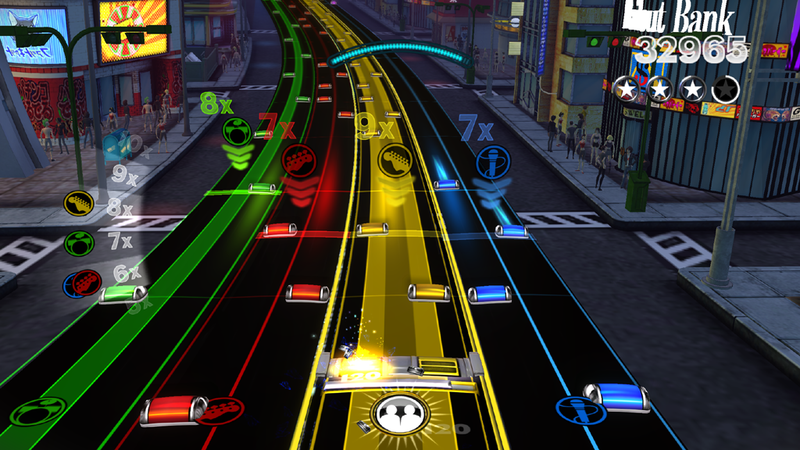 When explaining what this shifting of franchise gears means for the numbered games in the series, Nordhaus referred to Rock Band Blitz as a “compliment” to Rock Band 3. 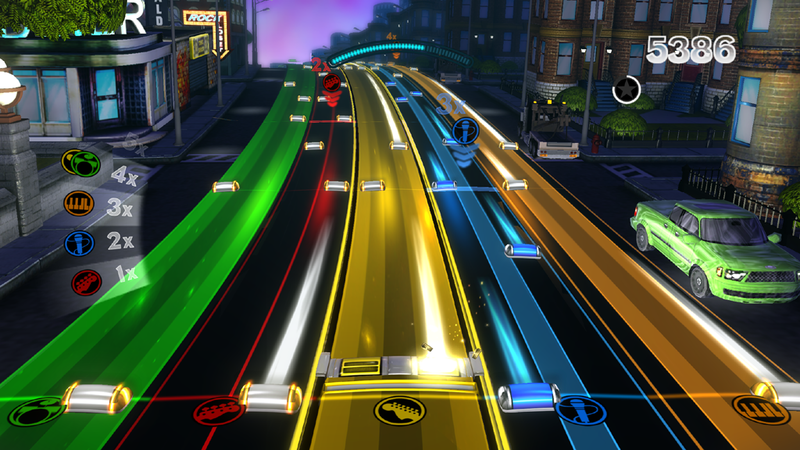 “We’re not seeing this…as like…the ‘replacement’ of Rock Band 3, we’re seeing this as another way for you to play the songs, because a lot of people have invested in their songs,” he said. The idea is for the game to provide a quick way for gamers to jump back into Rock Band without worrying about dragging out all the plastic instruments, or about who on their friends list has what songs. Even after an hour of demoing the game, the concept still seems strange; the experience was an enjoyable one, though. The lightning-fast load times, noticeable lack of accessories, high-score competitions and easy-to-learn but difficult-to-master gameplay are certainly elements that make sense for an Arcade release. Will this stripped-down approach be able to hook gamers used to the full production, though? It’s hard to say after just a few rounds with the title, but my desire to have a more extensive go at it and find out is strong. Update: I’ve just returned from the show floor at PAX East where I had the chance to take Blitz for another round. 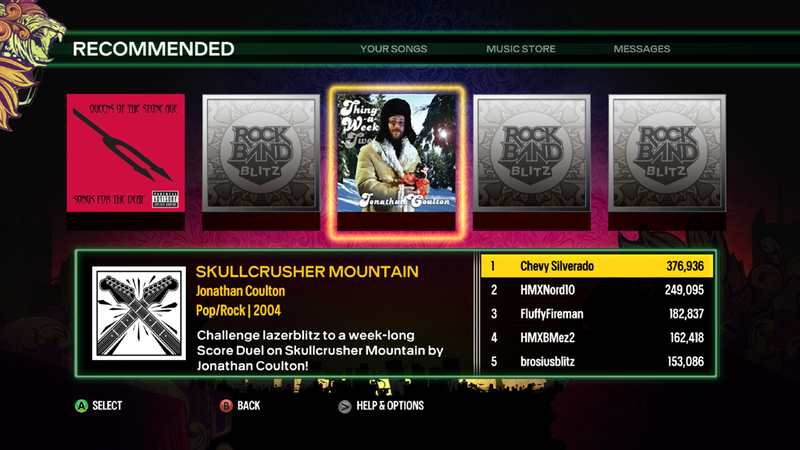 The build at PAX was different from the one that was on display over at Harmonix yesterday, with more songs being available and the points gained from certain power-ups being tweaked slightly. This time I played Band on the Run by Paul McCartney and Wings. It was surprising how much more tuned-in I felt after playing the game the previous day, and having that experience made it even more fun — a good sign that the game will be able to grab hold of gamers for the long run. 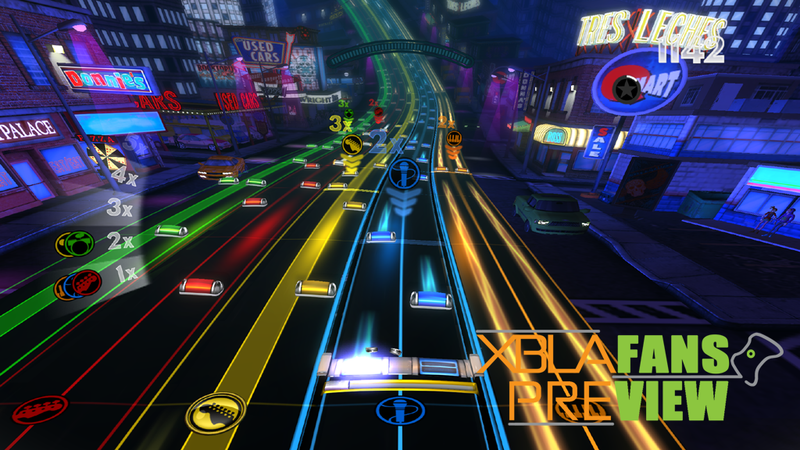 Skipping around the various tracks frantically in an attempt to keep pinballs on the screen while still hitting notes was a real blast and has me excited for the day Rock Band blitzes XBLA this summer. 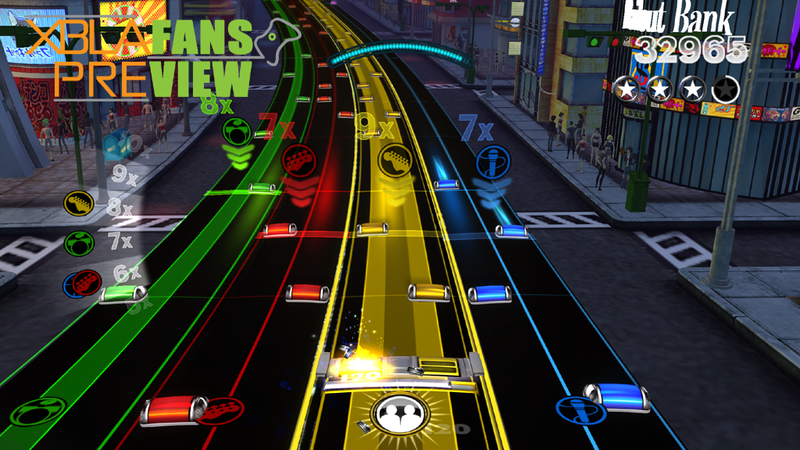 Check out more awesome XBLA game previews and impressions from PAX East 2012!